RT switches are used in general industrial, heating and marine sectors. The RT single pressure switches series consist of a variety of controls including neutral zone pressure switches and safety pressure switches for steam boiler plants. 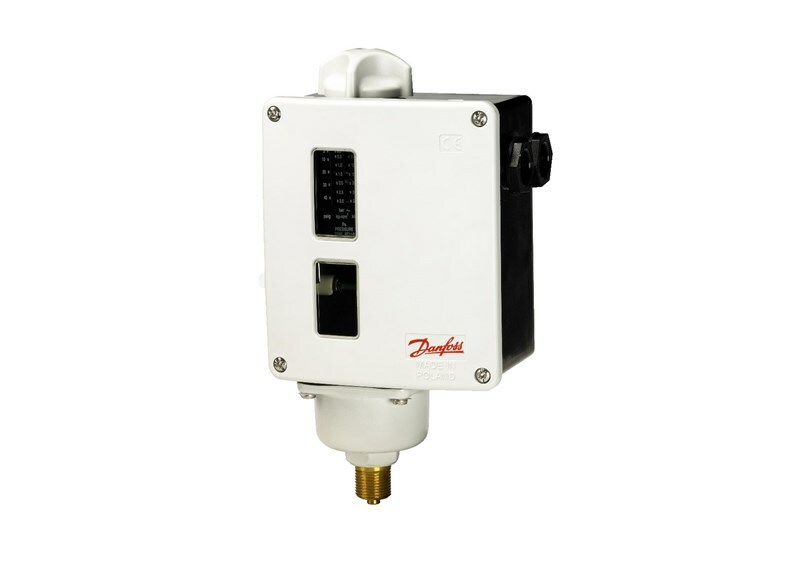 The Danfoss RT pressure switch programme covers working ranges from -1bar up to 30bar. The switches feature high accuracy, repeatability and stability over time, making them highly reliable. Outstanding vibration stability ensures for flawless operation even in heavy-duty applications. All contacts are “snap-action” types, maintaining the contact force until the moment of contact break. Units with gold-plated contacts are ideal for low electrical loads while the silver-cadmium contacts are developed for high loads. RT switches have been in service for more than 70 years. Also available with gold-plated contact systems. Available with min. and max. rest function (IP54). Also available as differential switch. Available with all relevant marine approvals. Contact material: Silver cadmium oxide (other contact types available as accessories. Please contact us for details). Loads: AC-1 (ohmic) 10A, 400V | AC-3 (motor) 4A, 400V | AC-15 (inductive) 3A, 400V. Ambient temperature: -50 to 70ºC.